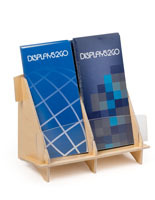 Sometimes, offering takeaway literature to patrons or visitors requires a more suitable presentation. 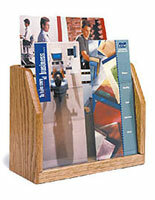 Wooden folded pamphlet displays elevate your interior's decor much like fine furniture. 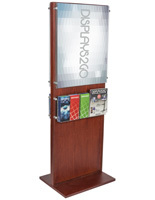 Locations such as law offices, hotel lobbies, and universities all benefit from utilizing this traditional material. 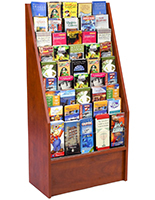 Most of our wooden folded pamphlet displays feature solid wood construction with a dedication to quality workmanship. 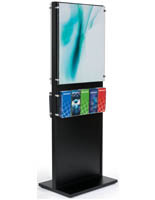 If your establishment is a top-tier business, then the fixtures showcased inside should reflect that. 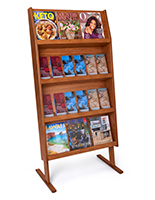 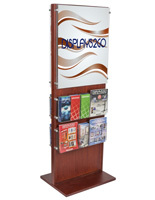 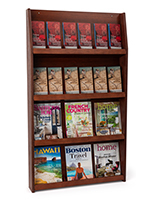 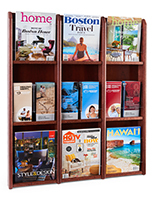 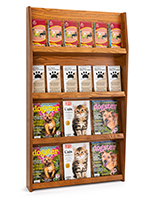 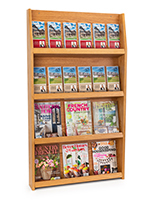 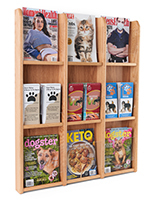 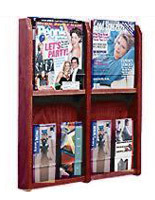 We sell wooden folded pamphlet displays in countertop models, floor stands, and wall mounted racks. 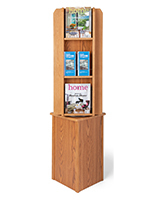 Northern Red Oak hardwood is the predominant species used in the manufacturing. 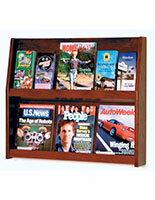 Light and dark stains are available, as well as red mahogany. 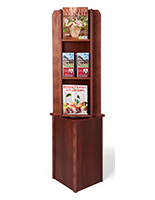 Nothing beats the beauty of real wood! 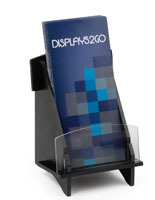 How can these upscale brochure holders be used? 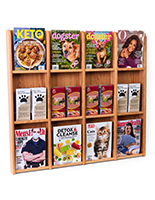 Countertop wooden folded pamphlet displays come in single or dual-pocket designs, with or without tiers. 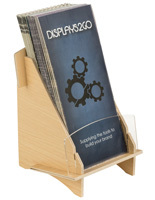 Small enough to be placed on desktops or tables, these tri-fold literature holders make the perfect accompaniment to lobbies or waiting areas. 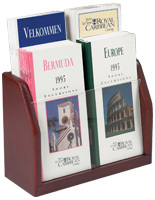 Tabletop brochure spinners provide the most amount of storage space — up to 16 tri-fold slots. 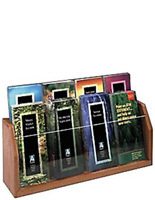 Whichever countertop holder you choose, they provide an attractive showcase for your promotional literature! 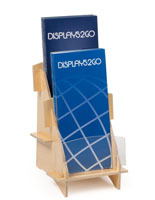 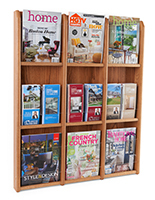 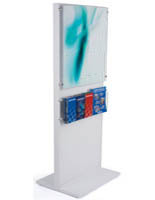 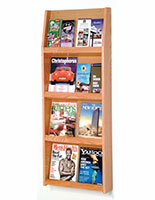 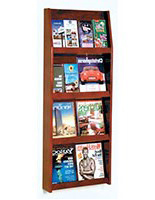 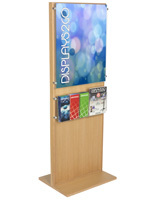 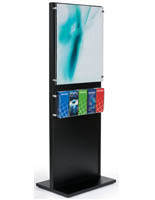 Floor standing wood pamphlet displays have the advantage of being able to be placed anywhere. 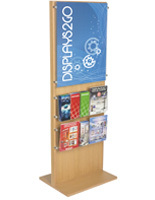 Not relegated to a table or wall, the stands offer the ability to target the public with strategic placement. 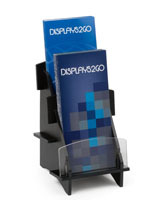 Place them near entrances, hallways, or queue lines for the most exposure. 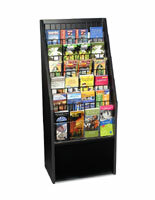 We sell tiered models with 6 to 9 levels — that's a lot of folded brochures! 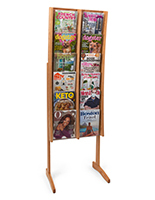 Other styles come with open-shelf designs, as well as free-standing spinners that the visitor can browse at their leisure. 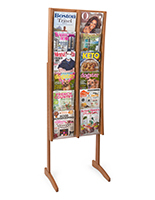 Wall mounted wood literature racks save the most amount of space for obvious reasons. Capacities range from 8 to 24 standard tri-fold brochure slots. 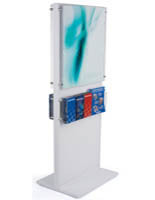 One style features clear acrylic stops that keep the contents upright. 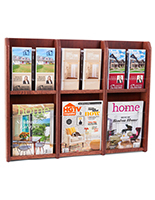 Other models have simple open-shelving with trays that lean your materials against the backer. 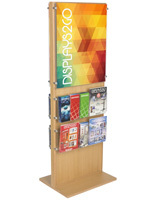 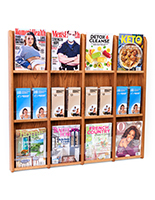 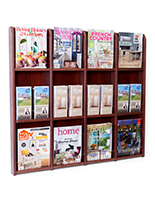 Like the counter and floor styles featured above, our wall mounted brochure racks are available in three attractive stained finishes. 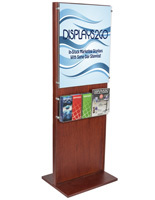 In addition to storing and offering access to promotional materials, these wooden literature displays are also adjustable. 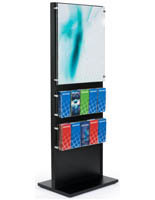 Pocket dividers (specific models only) can be added or removed to produce slots big enough for full-size periodicals. 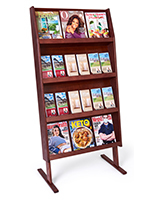 This option provides great flexibility when you need to display reading materials of different sizes. 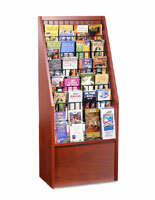 Customers have reviewed these products, stating it's the #1 consideration at time of purchase. 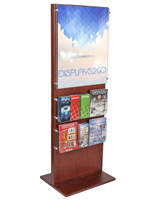 They've revealed these fixtures are not only perfect for folded brochures, but also flyers, forms, magazines, and catalogs. 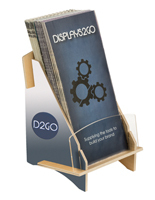 Looking for a more affordable option for offering promotional literature? 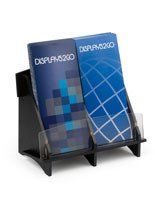 Acrylic brochure pockets are an inexpensive and lightweight alternative!